Anne-Sophie Mutter: 35 Years, 40 Recordings : Deceptive Cadence Hear excerpts from the acclaimed violinist's new 40-CD box set. The first recording sessions (Mozart Violin Concertos nos. 3 & 5) with Herbert Von Karajan and the Berlin Philharmonic, February, 1978. With Witold Lutoslawski and Paul Sacher in London, 1988. At the Beethoven-Haus, in Bonn, examining Beethoven autographs of the Violin Sonatas. In New York, January, 1997, at the time of her Brahms Violin Concerto recording with the New York Philharmonic. Rehearsing the "Tango, Song & Dance" sessions with Andre Previn. Publicity photograph by Dieter Blum. 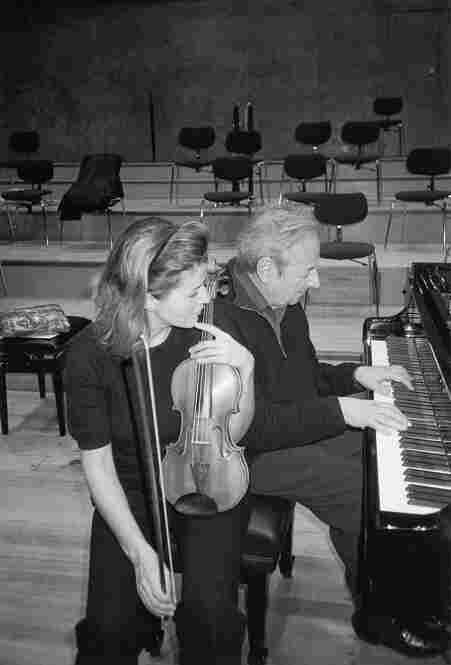 With her regular chamber music partner, Lambert Orkis, in 1996. Clowning with pianist Lambert Orkis. 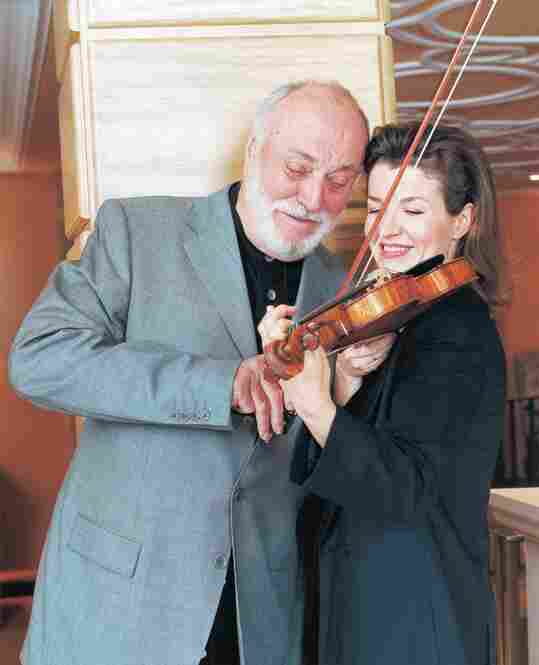 With conductor Kurt Masur, in New York, 2002. 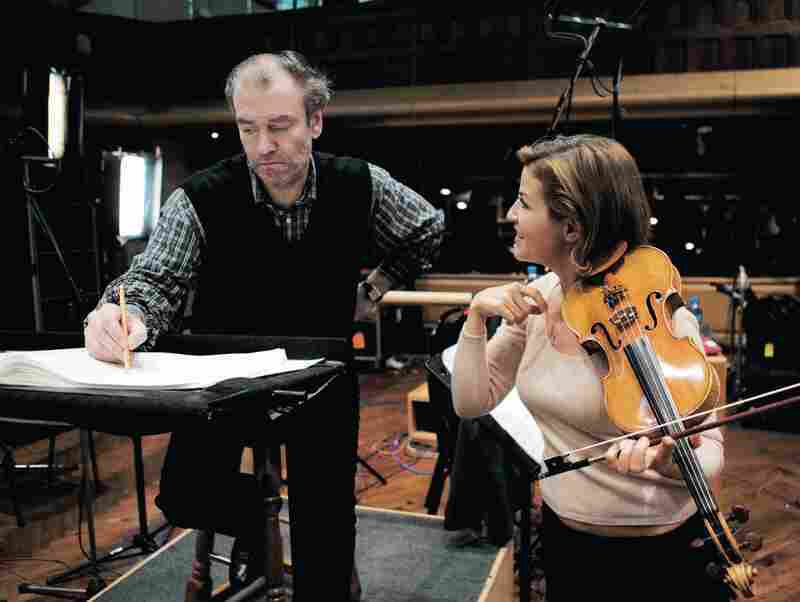 Recording Sofia Gubaidulina's Violin Concerto, "In tempus praesens," with conductor Valery Gergiev and the London Symphony Orchestra, February, 2008. 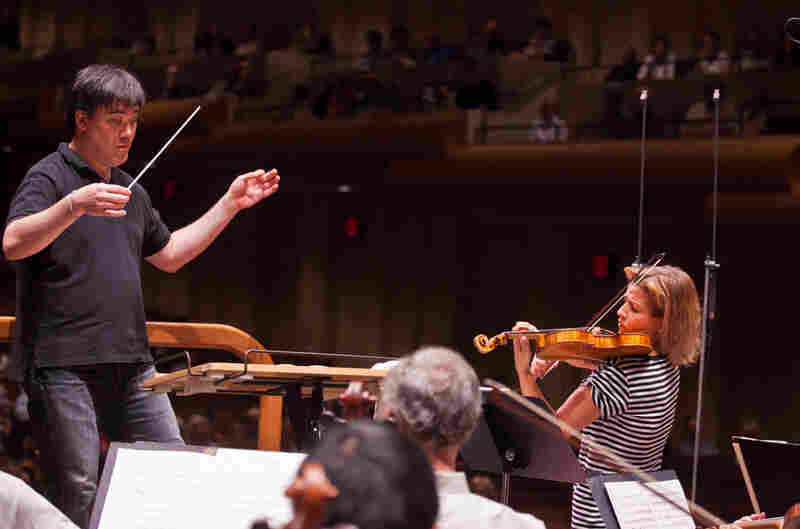 With New York Philharmonic conductor Alan Gilbert. Even for a musician as acclaimed as violinist Anne-Sophie Mutter, September is stacking up to be a pretty big month. On the 13th she released a new CD of four world premieres written especially for her. Last week, she opened the Pittsburgh Symphony's season, and next week she'll kick things off for the Boston Symphony Orchestra by performing and conducting all five Mozart violin concertos over two nights. I'm told she'll make an appearance on Letterman on the 30th, and then there's her 40-CD retrospective box set, ASM 35: The Complete Musician, which is released today by her long-standing record company, Deutsche Grammophon. The set celebrates the 35th anniversary of Mutter's stage debut at age 13 in 1976. It collects all of her DG recordings plus two discs of rarities and an impressive 288-page hardcover book stuffed with photographs of the attractive violinist, some of which can be viewed at the top of this page. Never mind that it's all housed in several clumsy layers of plastic shells reminiscent, in their translucent red, yellow and green, of a Habitrail. The 40 discs, in paper sleeves reproduced with their original covers, contain a fascinating trove of music, from Bach to Gubaidulina, from the 11-year-old Mutter playing Prokofiev to last year's release of the Brahms Violin Sonatas. 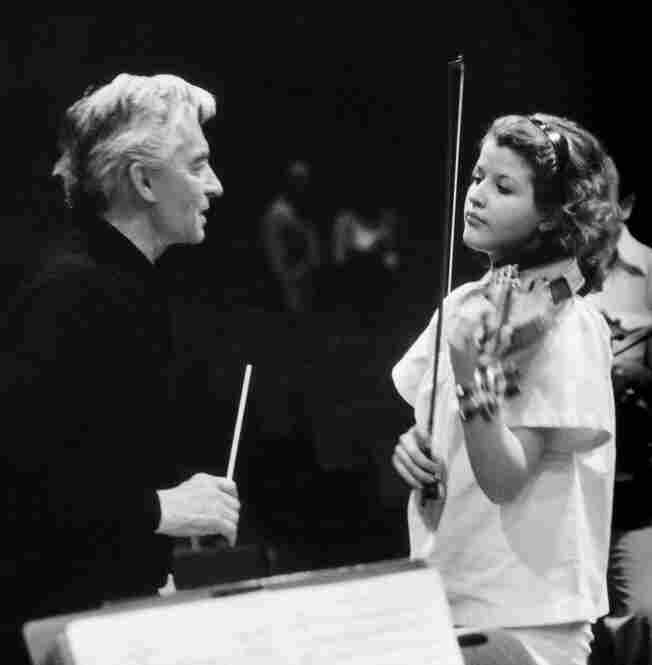 Mutter's career shifted into high gear almost immediately after she met conductor Herbert Von Karajan, for whom she first auditioned in 1977. She told me in 2008 that at the time she was invited to play for Karajan she had no idea how he might fit into her career. "Karajan was as far away from everyday life as Earth is from Mars," Mutter said. "I was not only frightened, but I thought it was totally senseless to go to Berlin in order to fail. I postponed the audition date once or twice — but then I had to face reality, and go." 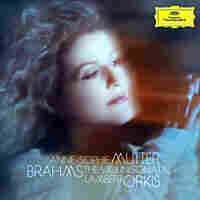 Mutter's first recording with Karajan came just a year later. 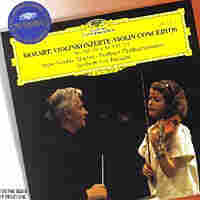 Listening to the Mozart Violin Concertos nos. 3 and 5, you can already hear the buttercream tone and a confidence far beyond her age — which was then 14. She followed up with the Beethoven Concerto, controversial in its expansive tempos, but a huge achievement nonetheless. Mutter said you can definitely hear the conductor's influence in her playing. 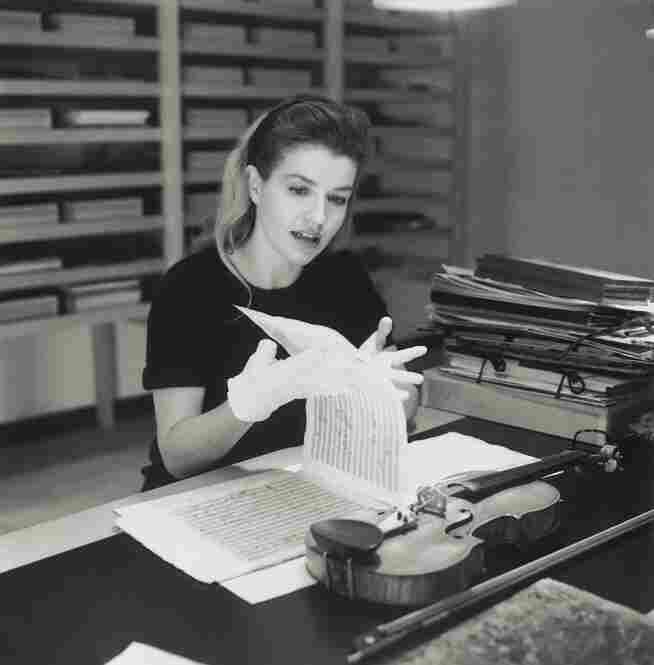 "Karajan taught me very early," she said, "to analyze the score and, specifically in the Beethoven Violin Concerto, to see myself as part of the whole." Mutter performed and recorded with Karajan for more than ten years, but he wouldn't be the only important figure in her musical life. She forged strong connections with living composers, and paging through the discs of this set, it's obvious that few high profile violinists have devoted so much energy to contemporary music, both orchestral and chamber. In ASM 35 she plays new pieces by Krzysztof Penderecki, Witold Lutoslawski, Wolfgang Rihm, Sofia Gubaidulna and Andre Previn (who was once her husband), all composed especially for her. It was while Mutter was studying Lutoslawski's Chain 2 (also in this set) that she had her new music epiphany. In 2000, she told NPR Music that there was a brief passage in the second movement that captured her imagination. "And from these few bars, I was so deeply moved that I wanted instantly to know the rest of the piece," she said. "And that got me hooked, basically, for the rest of my life. Not only to Lutoslawski's music but to the fact that there's so much inspiration you get from contemporary music, and it's obvious that in playing pieces that are created especially for you, you come as close as one can get to composing yourself." Not everything in ASM 35 is completely pleasing. Her recording of Vivaldi's Four Seasons (from 1999, backed by the Trondheim Soloists) misses the mark by a wide margin, opting for exaggerated dynamics as a stand-in for actual engagement with the music. 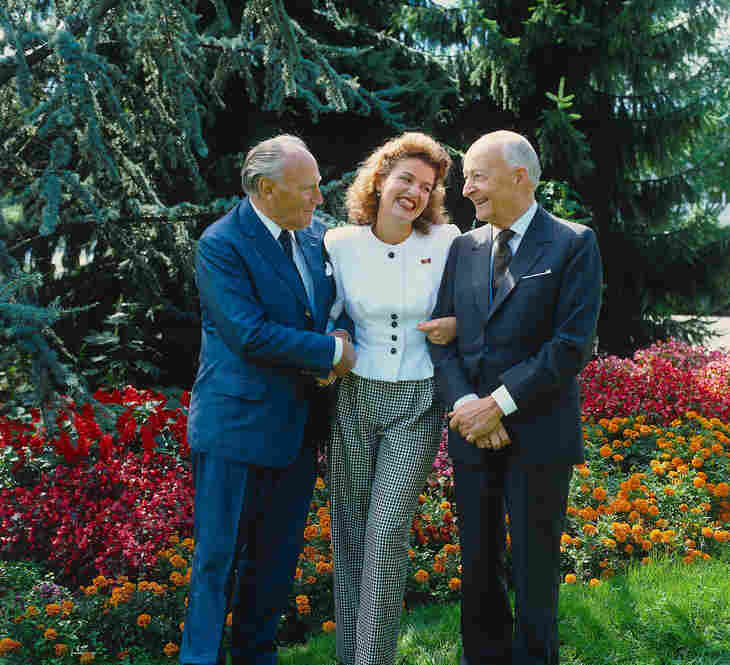 Her earlier Four Seasons recording with Karajan (in 1984) for EMI fares better, even if it's over-upholstered with the plush strings of the Vienna Philharmonic. In other instances (the Franck Sonata and at times in her Bartok Concerto No. 2 with Ozawa) her broad artistic license makes you wish she'd just play a phrase straight, instead of interpreting. The box also allows for interesting A/B comparisons: Brahms concertos from 1981 and 1997, Tchaikovsky from 1988 and 2003 and, perhaps most revealing, the Mendelssohn E minor Concerto with Karajan and the Berlin Philharmonic from 1980 and with Masur and the Gewandhaus Orchestra in 2008. The 1981 Gramophone review of the earlier recording notes that Mutter "plays with the most natural spontaneity, giving the listener a feeling of coming to the work anew." But in the same magazine 28 years later, the more recent live recording leaves the reviewer impressed but cold: "Every last detail has been dissected and considered, every phrase is minutely shaded; the subtleties of her bowing could in themselves fill a review. Yet I find the results strangely unmoving. It's live, but everything is so highly refined that it doesn't sound it: In Mutter's hands, the music has become perfectly embalmed." Still, the performances throughout are at an extraordinarily high level, whether you dip into the romantic rendition of Berg's Concerto, a kaleidoscopic Bartok Concerto No. 2, a bonbon like Sarasate's Zigeunerweisen or a contemporary chamber piece like Sebastian Currier's Aftersong (full disclosure: a live performance recorded by NPR in 1995). This is what we've come to expect from Mutter, an artist who routinely comes across as serious — perhaps too serious at times. 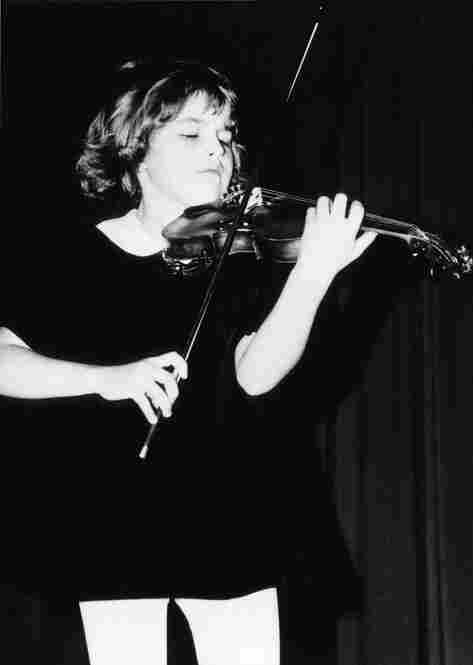 But it's fortunate that her passion is paired with restlessness, and a thirst for discovery that has resulted in new music for the violin and a violinist who plays it as if her life depended on it.